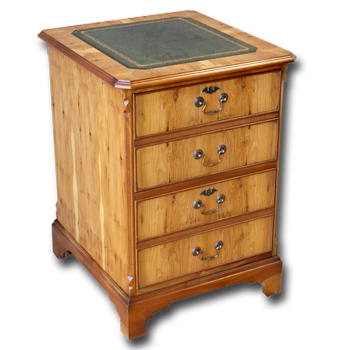 Superb quality reproduction serpentine desk with 9 working drawers. Made to order in your choice of wood, shade finish, handles and leather. High quality locally made reproduction captains swivel chair. The ultimate classic desk chair! Supremely comfortable with high quality gas lift mechanism, adjustable for height, rake, tension & lock. 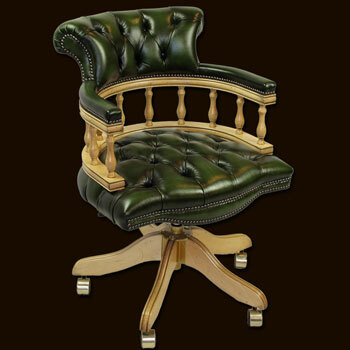 Chair pictured is finished in our antique natural oak wood shade with antique green leather but can be finished in any of our yew, mahogany or oak colours or to colour match to your existing desk. Well made English antique reproduction open bookcase with three drawers and three fixed shelves. Available in yew, mahogany, oak & burr walnut. Bespoke versions of this bookcase are possible - please ask.